John Smeed is a Chartered Professional Engineer now with half a century experience in the air conditioning an industrial refrigeration industry and has been acknowledged as a leader, not a follower in the HVAC&R industry. He is well known as an innovative designer and troubleshooter and responsible for the development of a number of successful unique and/or unusual design techniques and products. After working for one of the world's major air conditioning and refrigeration companies, York Corp., for twelve years, John formed his own company in 1972 which he then sold in 2001; after which he offered his services to industry as a consulting engineer. 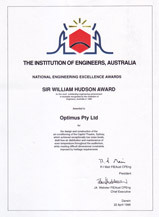 Optimus (name changed in 1992 from Siganto & Stacey Aust P/L) developed into one of the most effective Design-Construct HVAC companies in Australia which had 140 employees including 14 professional engineers when he sold the company to Hastie Australia in 2001. He has published a number of technical papers, was one of the founders of the Air Conditioning and Mechanical Contractors Association (AMCA) and a Life Member of the Australian Institute od Refrigeration Air Conditioning and Heating (L.AIRAH). His application since 1972 of 'Quickair' high velocity, low pressure air ductwork design technique still remains ahead of industry practice; enabling acoustically predictable, design duct velocities of over double the industry norm, without energy penalty but with significant capital cost and space savings. His development of 'Smeed Boxes' large, factory built, air conditioning assemblies up to 1400kWr capacity and 47,000L/s supply air quantity, achieved major savings in site labour time and quality control and were unique in Australia. The 'Smeed Operating Theatre Air Conditioning System' remains the most effective in Australia; the paper defining that system gaining the W.R.Ahern Award. John Smeed was responsible for the successful redesign of the air distribution system of The Concert Hall of The Sydney Opera House and designed the conversion of the Sydney Opera House Central Energy Plant to a Primary-Secondary Pumping System providing major energy savings. 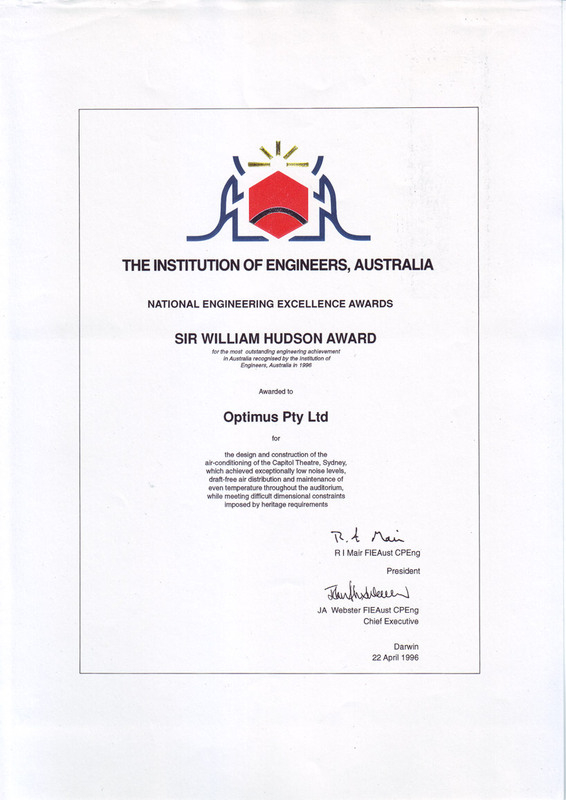 John's design of the air conditioning system for the Heritage Reconstruction of The Capitol Theatre in Sydney gained his company the Sir William Hudson Award (image right, click for full image), The Institution of Engineers Australia most prestigious National Engineering Excellence Award for all engineering disciplines in 1996. John Smeed formed a company with engineer, Roger Wilkinson, Entherm Pty Ltd (www.entherm.com.au) developing Spouted Fluidised Bed Combustion (SFBC) Systems and Differentially Fluidised Bed Combustion (DFBC) systems which are very efficient combustion systems for application in using low calorific value materials as effective energy sources in an environmentally responsible manner. More than twenty (20) Entherm SFBC systems have been applied in a number of countries and is considered to be a valuable technology in 'Renewable Energy' as an Energy from Waste (EFW) systems.